Formation and synthesis of particles by precipitation and other methods. Modification of particles by agglomeration, coating, comminution and attrition. Characterisation of the size, shape, surface area, pore structure and strength of particles and agglomerates (including the origins and effects of inter particle forces). Packing, failure, flow and permeability of assemblies of particles. Particle-particle interactions and suspension rheology. Handling and processing operations such as slurry flow, fluidization, pneumatic conveying. Interactions between particles and their environment, including delivery of particulate products to the body. Applications of particle technology in production of pharmaceuticals, chemicals, foods, pigments, structural, and functional materials and in environmental and energy related matters. 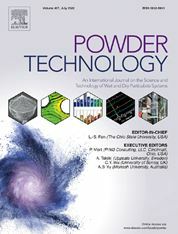 For materials-oriented contributions we are looking for articles revealing the effect of particle/powder characteristics (size, morphology and composition, in that order) on material performance or functionality and, ideally, comparison to any industrial standard.